My inspiration for this quilt were the tropical fishes I’ve been painting lately on our weekly come together on a small beach here on the island with some “island artists”. I wanted to “translate” one of my works into textile and was inspired by the books of Susan Carlson, who’s work I admire. 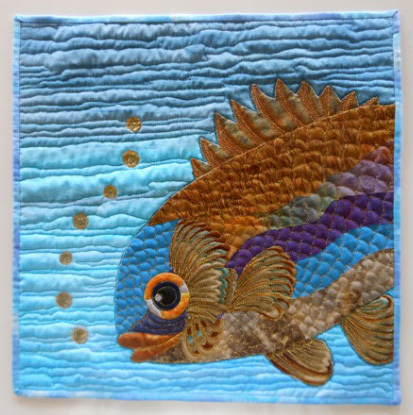 The fish is assembled with hand dyed and commercial fabric. The different parts are glued together, glued onto white muslin and then the complete fish is cut out and put onto a background. Before I started the dense quilting I covered the whole fish with a black tulle netting. Background is quilted with vertical lines to represent the water current. Bubbles are ironed on with the foil transfer method. 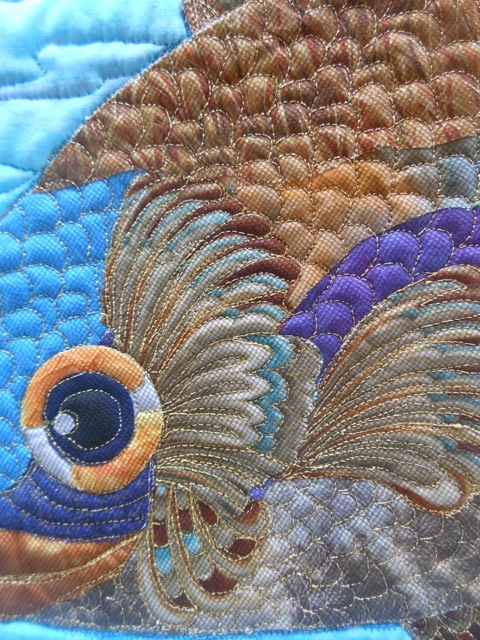 I saw this on your blog and already commented…I still think your quilting in this piece is exquisite!! Els I love the fish. The scales look so realistic. The colours are gorgeous. Els, I love your fish he looks ready to swim right out of the quilt, just fabulous.